This time of year in middle Tennessee the sweet scent of fresh strawberries permeates the air. People flock to the flat bead trucks that sit road side with pints full of the sweet fruit. Their season is short, sweet, and delicious! There is no sweeter flavor than that of a freshly picked middle Tennessee strawberry! With that being said it is my strong desire to keep the taste of the scrumptious delights in my pantry for at least a few months past the short picking season. This year I decided try my hand at some strawberry jam. 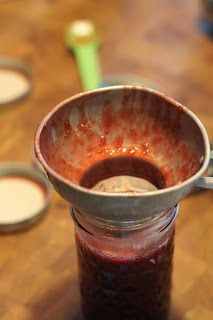 I have made jellies in the past with about a 40% success rate when it comes to using pectin so when I saw this recipe that did not require the finicky ingredient I thought it might solve improve my chances of success! Hint: easy way to hull the strawberries is to use a straw, push through the bottom of the strawberry and the stem will pop right off! In a wide bowl, crush strawberries in batches until you have 4 cups of mashed berry. In a heavy bottomed saucepan, mix together the strawberries, sugar, and lemon juice. Stir over low heat until the sugar is dissolved. Increase heat to high, and bring the mixture to a full rolling boil. Boil, stirring often, until the mixture reaches 220 degrees F (105 degrees C). Process in a water bath. If the jam is going to be eaten right away, don't bother with processing, and just refrigerate. first time to see this type of jam .! good work. !